Now Carrying Garmin Motorcycle GPS! While I'm sure we all enjoy getting lost on some twisty back road carving out our own two-wheel path, there are times where it pays to know how to get home. Decades ago, the answer to this problem was to buy a paper map or atlas. While incredibly detailed, using massive foldable paper maps was cumbersome enough in a car, let alone on a motorcycle. Plotting a route either required memorization, or frequent stops to check your bearing. The modern era has supplied us with GPS units that solve this problem beautifully. However, if any of you have tried to use an auto GPS on a motorcycle, you will know that it doesn't quite transfer. Enter the Garmin Motorcycle GPS! Instead of shouting commands at you over the rush of the wind, or requiring you to take your gloves off to operate, the Garmin Zumo line caters to a rider's style allowing for integration with a bluetooth headset. In addition, the display, mounting system, and information databases provided with these units are structured in a way that is most useful for motorcyclists. To begin with, we've chosen three of the most popular and proven models. 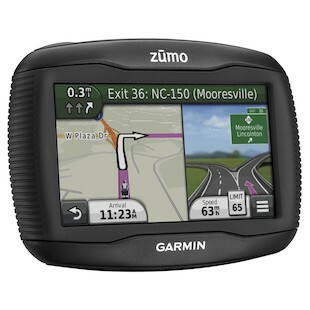 First up, the Garmin Zumo 660LM Motorcycle GPS. In addition to its standard directional features, the 660LM is also a self contained MP3 player that has the ability to stream wirelessly to your bluetooth headset, or via a wired headphone jack. A rugged waterproof case resists the wear from temperature, moisture, and the sun. In case you didn't know, "LM" stands for "Lifetime Maps" meaning that you will always be up to date on road changes for the life of the product. To increase your battery life from 5 hours to 7 hours, try the Garmin Zumo 350LM Motorcycle GPS instead. The 350LM also allows you to store up to 100 routes instead of 20 and will give you trafficTrends based on the predicted flow of the cagers. While you see some substantial upgrades in the software and mapping services on the Zumo 350LM, note that this one is not an MP3 player. 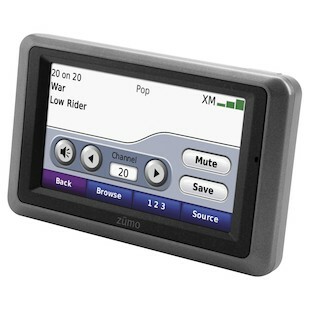 At the top of the line, the Garmin Zumo 665LM Motorcycle GPS adds radio, traffic, and weather receivers over XM radio. MP3 and Audio book playing is back in the feature list with full A2DP technology. Other cool tricks include the ability to navigate to geo-tagged photos and the Garmin Lock anti-theft system. The only downside to the Zumo 665LM is that the battery is quite a hog. This model is best used with a permanent powered mount, which can be solved with this Powerlet Cable for those with pre-existing connections. You can also use the direct battery leads that come with the unit to wire your Zumo. 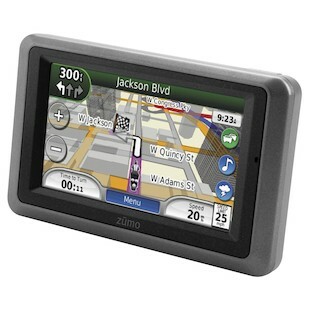 These Garmin Zumo Motorcycle GPS units will be available mid-February at RevZilla.com. Once you are outfitted, you'll only have to get lost if you really want to.